So what is this leaf peeping thing? It is a common, hip term for people just like me who travel to view and photograph the fall foliage with its brilliant yellows, oranges, and reds. However, how many of you have done an adventure leaf peeping trip? I recently came back from the coolest, leaf peeping trip in the Finger Lakes of New York. Check out the range of outdoors activities that can enhance your next travel adventure to the Finger Lakes. Which of the activities is your adventure travel style? Or do you want to claim more than one? Join me! Let’s go leaf peeping! Yes, you guessed it. 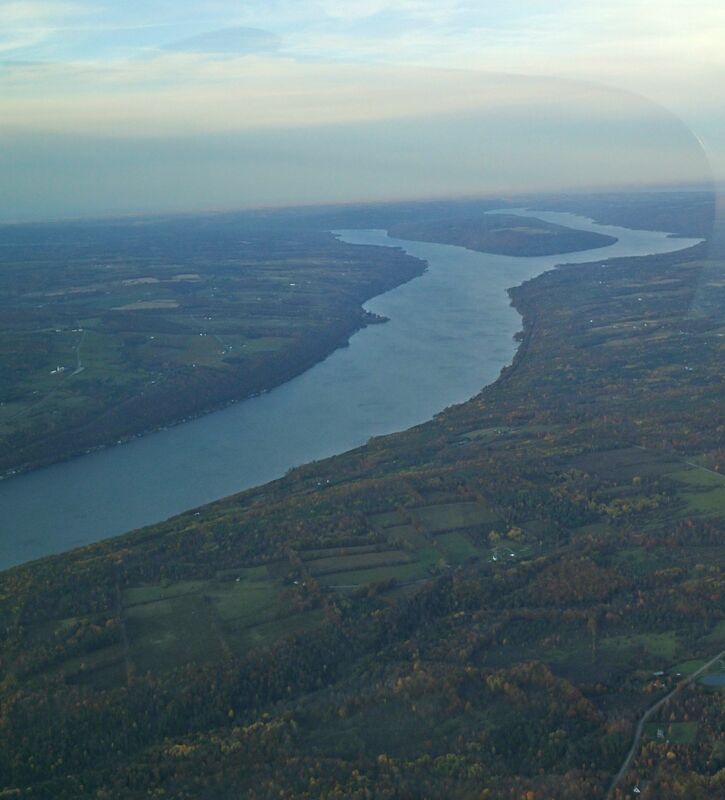 I took leaf peeping to another level just outside of Corning with a scenic flight. It was a great way to experience leaf peeping a la adventure, but also it was an awesome way to get my bearings of the Finger Lakes region. It certainly helped that my pilot, Joe of Costa Flying Service, was a life-long resident of the area, giving plenty of advice and of course pointing out vineyards not to be missed along the lakes. Perhaps you are afraid to fly or what to do something a little easier. 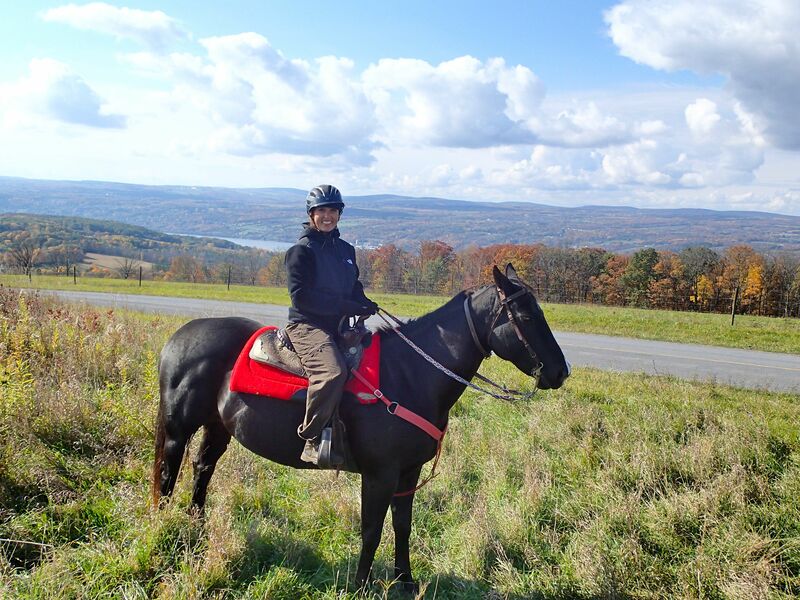 Why not leaf peep via horse on a trail ride through the Finger Lakes? Even if you aren’t a skilled rider, Painted Bar Stables can walk you through how to be a better and safer rider while allowing you to thoroughly enjoy the outdoors. You can see that after nearly three years without riding a horse, my mare, Crystal, and I had a gorgeous ride, albeit I came back to the stables with mighty sore legs and bum. If you prefer to be on the water while you leaf peep, here’s another way to enjoy the Finger Lakes via kayak with Friends of the Chemung River. It certainly was a different vantage point than from high above in the plane or trotting along via horse. 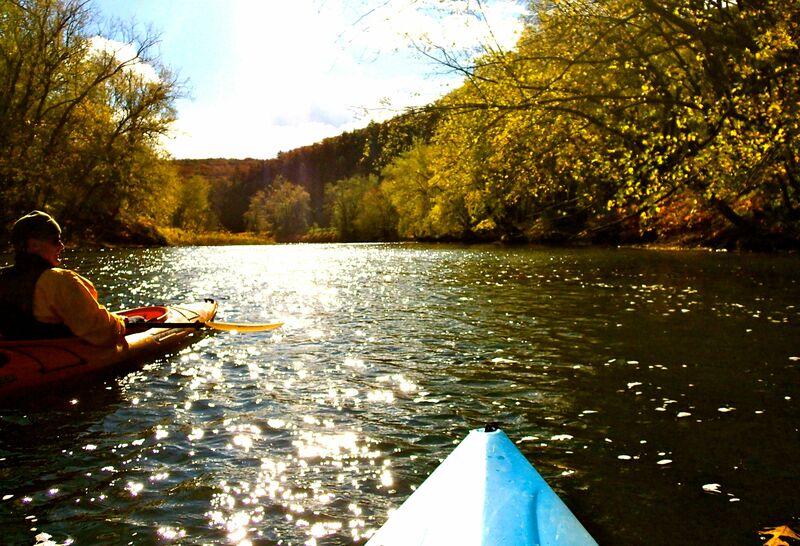 Kayaking the Chemung was a peaceful paddle and float through nature. The route was about an hour downstream with a few gentle rapids and islands to navigate. The conditions were absolutely perfect for fall kayaking: sunny with a light breeze at our backs. Now, if you aren’t interested in any of the above, how about just hiking with the power of your own two feet? 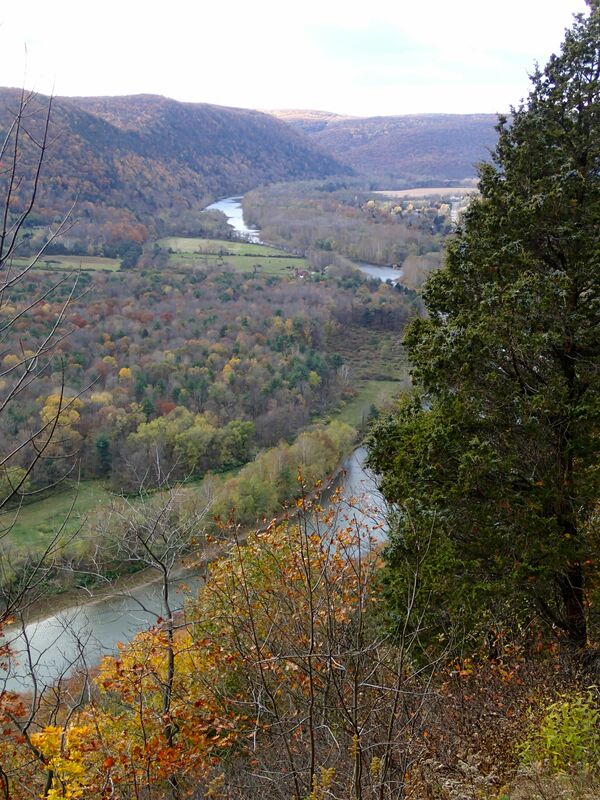 Leaf peeping doesn’t get any better than this view from Frenchmen’s Bluff in Tanglewood Nature Center. The trail is well-maintained and marked with very easy grades. In fact, if you are interested in learning more about one of the Finger Lakes’ most famous visitors, there are quotes from Mark Twain along the trail. All are related to nature as he too was a lover of the beauty of the Finger Lakes. So which one will you choose for your travels to the Finger Lakes? You could do them all. I did. And, it was a blast. As always, stay up-to-date on more adventure travel stories and tips from the Finger Lakes, Peru, Quebec, Cuba, Minneapolis, Kauai, and more by connecting with me on Facebook, Twitter, Google+, and YouTube. And, please share your best Finger Lakes adventure travel stories and/or tips. I’d love to hear from my adventureros near and far. Look around! We have reached Mid Point of leaf changing here in the Finger Lakes (that is, according to iloveny.com). Like I did at “ Just Changing “, I took my family out to explore what Mid Point Fall Foliage looks like in the Finger Lakes.